Centre-back Sam Todd has joined Finn Harps for the 2019 season. DESPITE speculation he could return to Derry City, young defender Sam Todd has rejoined Finn Harps for the 2019 season. The talented centre-back, who was on-loan from Derry City last season, played a major role in Ollie Horgan side’s promotion charge from the First Division. Todd, who netted four goals last season, signed for the Donegal men last week and is expected to play a big role in Harps’ return to the Premier Division. The 20-year-old emerged as one of Harps’ most important players last season and played his a major role in shoring up the defence and helping his team have the best defensive record in the division. The Carndonagh man made his Candy Stripes first team debut against Danish side FC Midtjylland, in 2017, in City’s Europa League second leg encounter, which took place Sligo Showgrounds. After a few appearances in the first team under Kenny Shiels’ stewardship, Todd moved to Ballybofey last season to gain regular first team football and having played his part in Harps’ return to the flight, he has decided to return to Finn Park for the 2019 campaign. Another ex-Derry man on the move is centre-back Seamus Sharkey, who joined Glenavon at the weekend. The Lurgan Blues, who played out a thrilling 3-3 draw with Institute on Saturday, announced Sharkey has signed a two and a half year deal. The former Derry City man played under ex-Cliftonville manager Gerard Lyttle at Sligo Rovers last season and will join Glenavon next month. “I’m delighted to get Seamus at the club. With his experience in the League of Ireland, he’s a good player who should bring a bit of experience and add to us in January when he’s available to play,” Hamilton told Glenavon FC website. The 28-year-old, who is currently on a break following the concluding of the League of Ireland season, will know a few of his new team-mates. 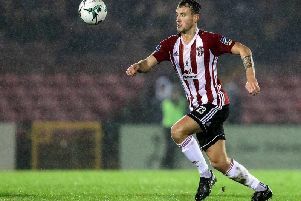 Sharkey played with Mourneview Park fans favourites Josh Daniels and Ben Doherty for Derry City while at the Brandywell.